or, fueled by a wonderful e-mail from the dentist on Thanksgiving night, before the trytophan got him, and plenty of gorgeous-fancy dentist websites, I can upgrade! well, at least get the names in of the whole team. whether it's a whole 1 point upgrade can be argued later. "Need that like a hole in your head!" they always say, like you'd never need another hole in your head. Well, I guess I was needing it, because it was decided by a consultation of the elders (and the folks with the fat stacks) that a hole in the head was exactly what I did need, because #8 got sorely (haha!) kissed by the fence-top outside the original Big People Scooters, and while it fit back in for a couple of days, it finally came out at the dentist who determined it quite dead at that time. 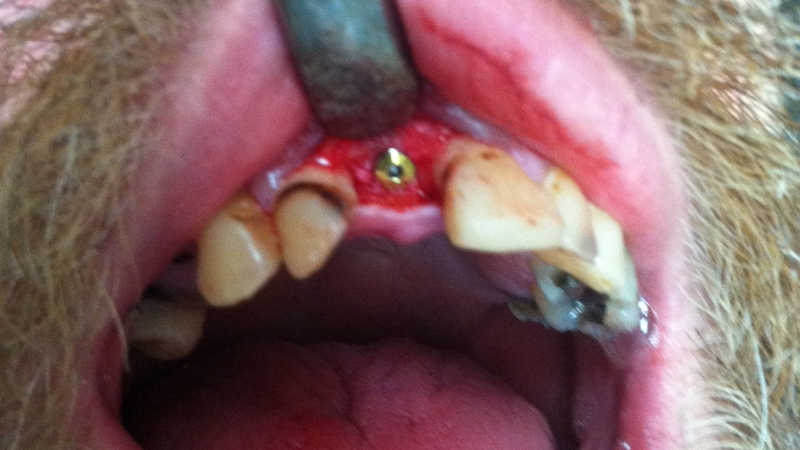 That's what my skull bone looks like with the gum slit and slid back by a Seldin Eeeuw. Oh, and the hole wasn't there. Doc Hughes says he made that fresh that day, and I believe him, as there was some tunnel-boring noise and vibration going on (I wanted to put my hands behind my head to hold it steady! 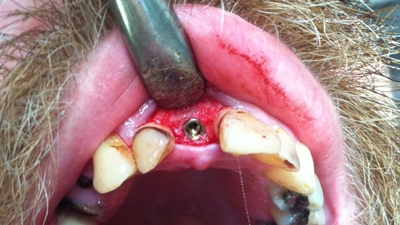 ), and that doesn't look organic whatsoever, and you can see a little bone thread up in there, right? 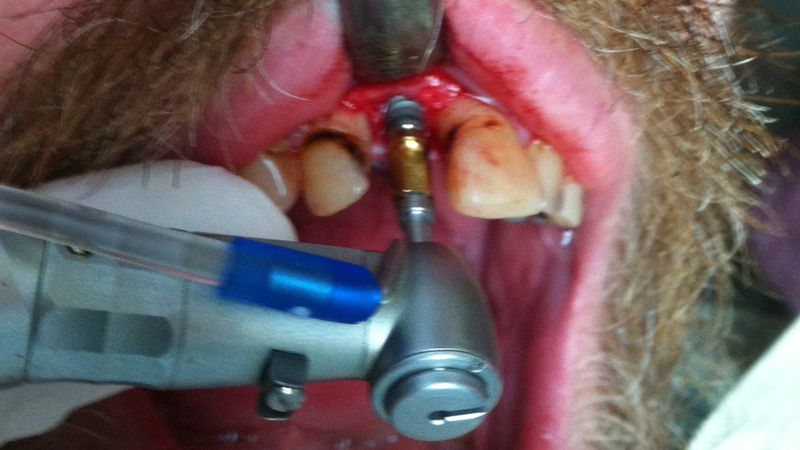 So after you get the hole all nice and purty, and have called dental assistant/staff photographer Christine away from the office phone so she can take pictures inside your mouth with her pocket's iphone, you get out the "titanium implant". They're kind of nasty looking things, which I didn't get an actual picture of outside (sniff!) but Wikipedia's got a good one here, with the lower 2 bits I don't have yet. I suppose Doc Evans who's making the abutment and crown for me later will have a little extra room these days to scrape plaque and black off of #7 and #9, and drill and fill #10 over there, and all the other ones that need the same as well. You can see a couple of threads on it hanging out there. A Helicoil, my Dad likes to say, should you know what a helicoil is, as we know it's for fixing your bug or bus engine when you've thrown a rod in your aluminum case and unceremoniously ripped a stud or two out. Kind of like what I did to my tooth! 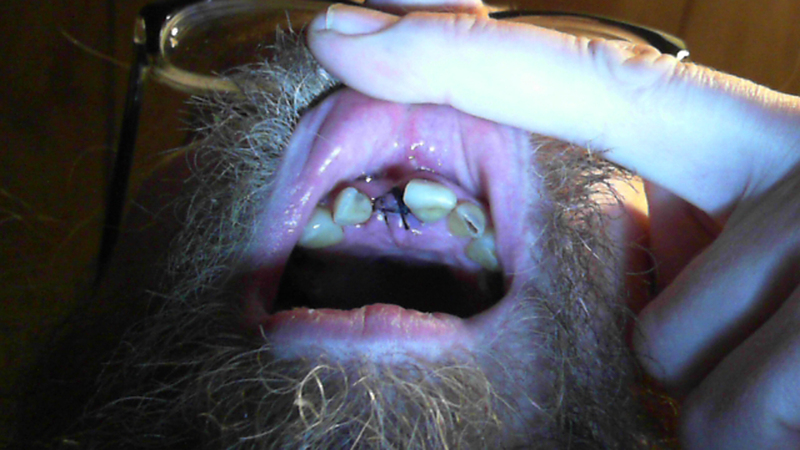 So I'm thinking I got a 3.8x12mm implant, because that's about how big the root that used to grow there was. Assistant Joni, who watched me while the numb came on and helped me with the water cup (which I hardly spilled all over myself as much as I could/should have as the numb crept in), at the beginning had a fancy transparency up on the X-ray viewing thing, and I had thought she'd lined up the 5.8x12mm over my X-ray and that's what we were going to screw in, but she wasn't trying to line anything up, it was my misunderstanding wholly, and I was a little happy that it was going to be smaller than what I'd mistakenly thought. Or, maybe, just then brain misfiring a little, we all knew the novacaine was working, and we could commence drilling the hole. Pretty cool how that all worked out. That goldish thingie is the "3-in-1 abutment" that fits on the tool and into (or around? is there a hex-head on that?) the implant for insertion. So you get it nice and flush with the bone. Eeuuuw. That's what skull-bone looks like alright. Nice colors with that iphone, Christine! So there it is, you get a hole in your head, in your mother-f***in' head. (hehe! from mp3skull!) But threaded on the inside now, for fanciness later. And dig that spit-string! Like a spiderweb in the rain, gorgeous! And after all that (like less than an hour? and we did spend a lot of time playing with the camera...) I got the teensiest man-hole (tooth-hole?) cover ever, installed with the tiniest torque-wrench ever. It was a ratchet for sure, I was joking about it being a torque wrench, but it right well might have been. 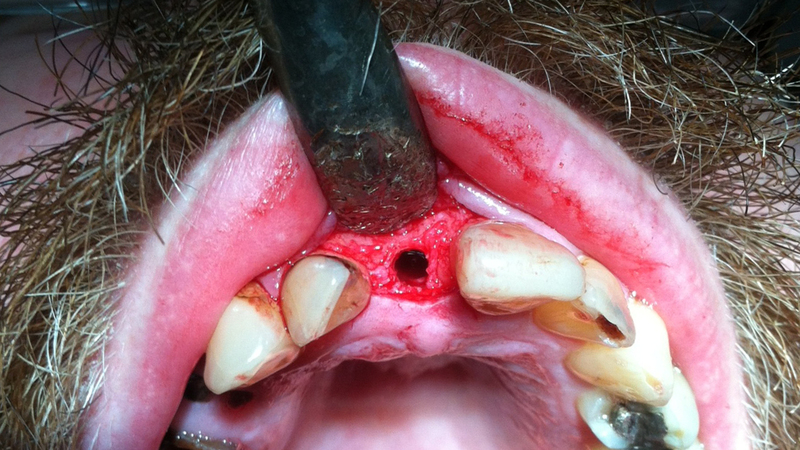 "Cover screw" is what Wikipedia calls it, but I was looking for a niftier name than that, and will stick with "teensiest man-hole cover" until I come up with something better, or the dentist provides one. "Like jewelry!" I said happily, seeing it on Christine's phone. It's just to keep the gum from trying to grow up into that fine (literally AND figuratively) screwhole we all just put in. It's pretty, no? Nice contrast between the blood-oozing bone and the shiny screw-head. And I'm glad we took a picture, because you just can't leave the office with your skull hanging out of your face, so they give you a little fancy needlework to cover it over, I'm thinking that the cover-screw is made out of material that doesn't like to have gum grow over it? Or maybe not, again, this is where I'll have to get help from the staff at the office. And while higher resolution here at home, the difficulties of positioning the camera, the light, your own lip, and the mouse over the "take a picture" button and clicking it all at the same time by your lonesome is always a tough one. But I'm getting far better at that, practice making perfect, slow and steady winning the race. Like bone growth! still want more? 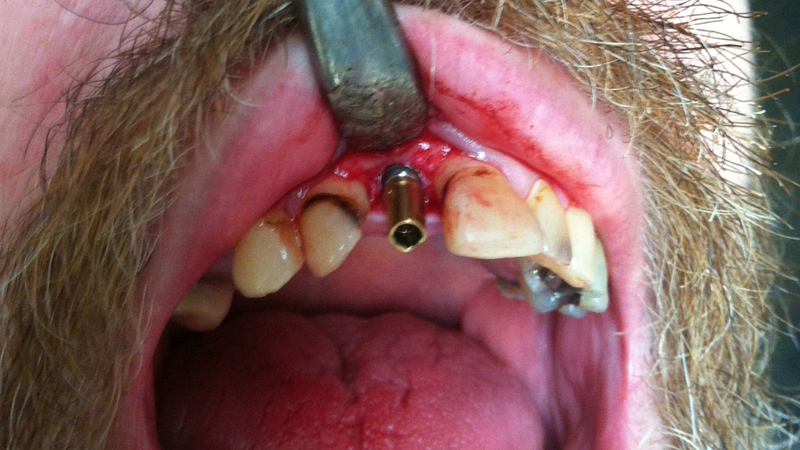 here's the Wikipedia pages for "dental implant", medical uses for titanium (which it's really good for! YAY! ), including its what I'm thinking should simply and most precisely be called "magical" powers of osseointegration, but then, there is some screwed in my head near my brain which might be making me think that way. Or the Vicodin?